COSHH Safety Poster. User-friendly text and clear instructions show employees how to prevent accidents and injury whilst maintaining a healthy working environment. Durable laminated construction with full colour illustrations. Compiled by qualified health & safety practitioners. The Control of Substances Hazardous to Health Regulations covers an employers responsibilities for managing exposure to hazardous chemicals. Does every business need to consider COSHH? Almost certainly. Even simple every day cleaning products like bleach are covered by COSHH. What is this poster for? 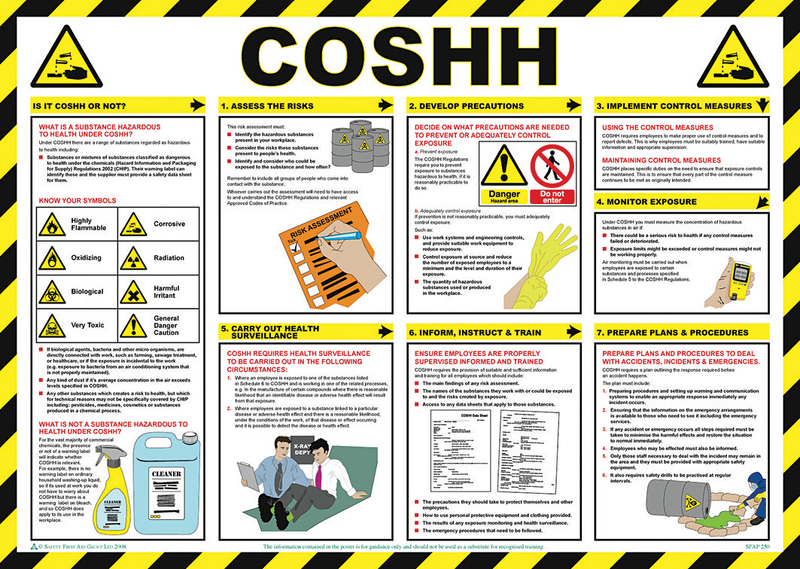 This poster covers a very straight forward view of what COSHH is and what actions to take in your business. Perfect for departments who haven’t received dedicated COSHH training, or as a reminder for COSHH trained staff. What does the poster cover? Is it COSHH or Not? This section gives a simple overview of how to conduct a risk assessment. This gives details on the main types of precautions you should consider to help control risks, including limiting access and limiting the amount of a hazardous substance available in the working environment. A summary of both how to implement control measures and how to maintain them over time. This covers off when air monitoring might be required to measure concentrations of potentially harmful substances in the ambient environment. What needs to happen when an employee has been exposed to a hazardous substance. What training, information (e.g. Data Sheets) and other information needs to be covered in training with your staff. What you need to plan for and how you should be prepared. Also this section contains advice on who to inform and information on conducting safety drills. Sign Text: COSHH Safety Poster. Protect Your Employees And Avoid Costly Accidents. This product is an information sign. These signs are used to indicate general messages or info. Safety Poster are used to provide both general and topic specific information about health and safety in the workplace and to raise awareness of safety matters. This product is a Health and Safety Sign. Health and Safety Signs use standard colours and symbols to convey a safety warning or message. This product is a Health and Safety Sign. Health and Safety Signs use standard colours and symbols to convey a safety warning or message. This product is a hazard sign. Hazard signs give a warning about a specific hazardous situtuation or dangerous condition. This product is made from paper encapsulated with laminated plastic protection. This sign is wider than it is tall. Suitable for fixing with self-adhesive tape. 420mm or approximately 17" high 590mm or approximately 24" wide. Interior signs are suitable for use in interior applications. Home signs are suitable for use at home. Office signs are suitable for office use. School / College signs are suitable for use in educational establishments, schools, colleges, universities. Factory signs are suitable for use in factories. Warehouse signs are suitable for use in warehouses Restaurant signs are suitable for use in a restaurants. Catering signs are suitable for use in a catering / kitchen environment. Farm / Agriculture signs are suitable for use in farming and agricultural environments. Garage / Motor Trader signs are suitable for use in a garage or motor trade environment. Shop / Retail signs are suitable for use in a shop or retail environment. Construction site signs are suitable for use on building and construction sites. Hotel signs are suitable for use in hotels and bed and breakfasts. Hospital signs are suitable for use in a health care environment; hospital, clinic and NHS establishments. Mines / Quarries signs are suitable for use in mining and quarry environments. Suitable for mounting on a wall Suitable for mounting on a smooth surface Suitable for mounting on a flat surface. Posters are signs with a larger quantity of information, normally used for general health and safety messages. This sign is approximately equivalent to A2 paper size. Signs in this range are from our standard range. Signs in this range are from our maximum choice range. Giving you the most choice of signs available in the UK. Signs in this range are the most popular choices. We currently have more than 20 of this item in stock ready to be dispatched. This item is available for standard delivery in 3-5 working days. This item is available for express courier delivery next working day.